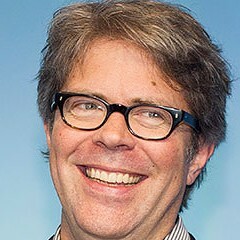 In its fully mature form, this species is known as "Jonathan Franzen." A wise woman (my Jane Austen professor) once observed that the best weapon a woman has at her disposal against a pompous man is to laugh at him. And then, of course, there is the 140-character miracle that is Twitter. But these elements did not come together until an evening this past September when Dana Schwartz, a native of Highland Park who is currently a senior at Brown, was thumbing through a stack of seven stories she had to critique for her writing workshop and realized that all seven of them were exactly the same. "They all had trains," she says, "and a man leaving his family because he is too complicated and deep. 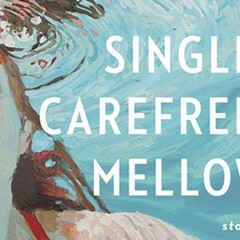 It was this wannabe sophomore lit writing that could be Jonathan Franzen, except not quite as good." There was also this: "The idea of Twitter is a sociopathic thing. You say things to 5,000 strangers about breakfast cereal. It's entertainment, you get out the message, and you indulge your narcissistic tendencies." The Guy's preoccupations these past five months have been simple, yet complicated: black coffee, American Spirits, whiskey, his artistic process, and the editors and women who fail to appreciate him. 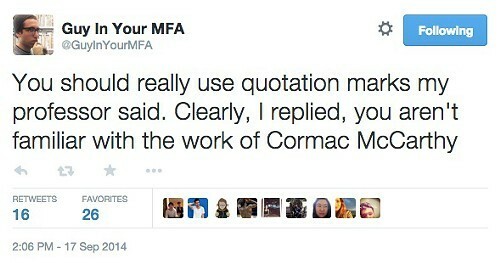 (He also has small sidelines in giving advice and selling personalized poems and Moleskines emblazoned with "WWDFWD?" on the cover.) There isn't much of a narrative arc besides deep, existential despair, but Schwartz enjoys plumbing the shallows of his tortured soul. "It's almost terrifying how easy it was to get into his mindset," Schwartz admits. "I can air out my worst impulses." The Guy now has nearly 40,000 followers. He attracted the attention of Neil Gaiman, who politely declined an offer to meet after his December talk in Chicago to drink whiskey and discuss literature: "I'm just a genre guy who got lucky. I'd be intimidated. Maybe I should introduce you to my agent, instead." Instead, agents have been contacting Schwartz. 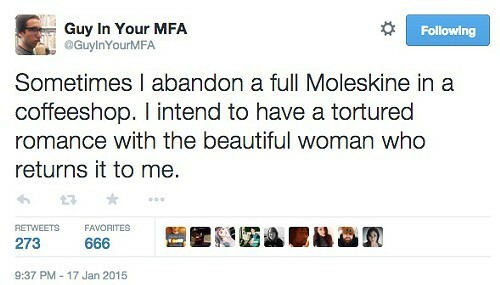 She turned down several before choosing one and starting work on a proposal for a parody book based on the Guy. 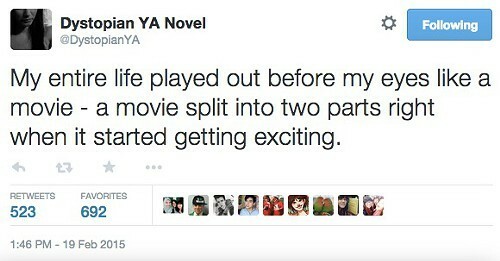 But while her agent was shopping that, she started a second Twitter account, Dystopian YA Novel, that gleefully mocks the Divergent trilogy and its imitators. Three weeks in, it already has 20,000 followers. "It caught on so fast," she says, "I thought it was a practical joke." 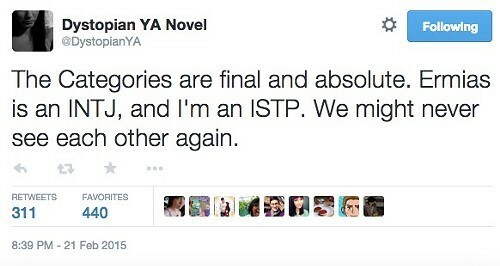 Now she's taking phone calls from editors interested in the actual dystopian YA manuscript she's been working on. 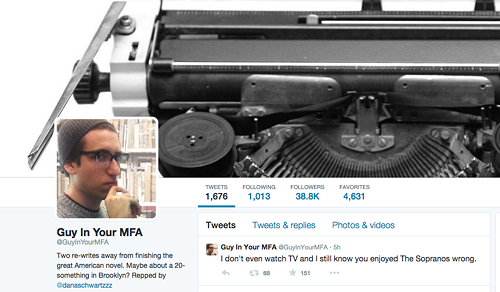 Both Guy in Your MFA and Dystopian YA Novel are linked to Schwartz's personal Twitter account. The guys in her fiction workshop who write about trains were nervous, she says, but since there were seven of them, plus many others of their ilk running amuck ("the bearded guy, leaving alone, drinking whisky"), no one has taken it personally. 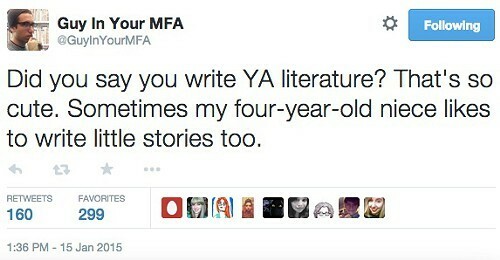 One of her fiction professors did have some words for her, though. "He said my work might be a 'commercial success,'" Schwartz says. "It sounded like a dirty word." The 25-year-old author of the wildly popular Divergent trilogy—which comes to an end this week with the release of Allegiant—talks to us about success, fear, and which faction she'll join after society falls apart.